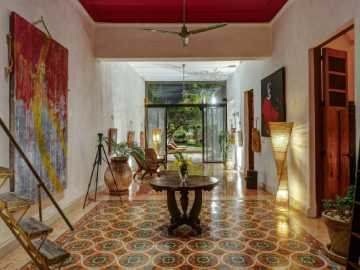 We are excited to have people come and enjoy the life and surroundings of our Hacienda Style Home here in Merida. We love to explore Mexico and have found a way to share our home for those wanting complete luxury and space, by renting it out in the high season for everyone to rent and enjoy. Our home has the amenities you could want or ask for including 3 Bedrooms and 3 Bathrooms. An outdoor, heated shower, large swimming pool, over 3,200 square feet of outdoor living space, outdoor Teak Seats and Loungers, a Fully Equipped, Modern Kitchen, 14 Foot, Complete Perimeter, Rustic, Stone Walls (for ultimate privacy) 2,800 square feet of interior living space and all the conveniences of home. And all this just a 4 block walk to Santiago’s Centro Historico, They host a Market, Vendors, Cafes, Shops, Grocery Store, Live Entertainment in the evenings and all the shopping you want to find just steps from there. We are very excited to have people come and find our home a true destination that offers all the necessary services, privacy and amenities that you would come to expect. In many cases we’ve found that people have shared such great appreciation for finding our home that they have recommended it to their friends, families and colleagues alike, including a few “Regulars”. Wanting to see more details of the surrounding area?